2008 AFLAC All American Bowman Rookie Card of Luke (Lucas) Bailey (AFLAC-LB) distributed exclusively in very limited quantities at the game at Dodger Stadium. 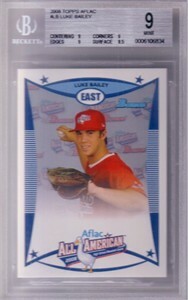 Graded 9 (MINT) by Beckett Grading Services (BGS). ONLY ONE AVAILABLE FOR SALE. Bailey is now a catching prospect for the Tampa Bay Rays.